October 20….NEEDTOBREATHE - These guys are a Grammy- nominated, American Rock 'n' Roll Band from South Carolina, effortlessly woven from the musical traditions of their upbringing in the Deep South of the United States. Comprised of brothers Bear Rinehart (vocals, guitar) and Bo Rinehart (guitar, vocals), Seth Bolt (bass, vocals), and Josh Lovelace (keys, vocals), the band signed to Atlantic/Lava/Word Records and quickly achieved cross-genre success via five studio albums and innumerable headline tours. In addition, NEEDTOBREATHE received wide ranging attention from the national media, highlighted by performances on such high profile TV outlets as ABC's Good Morning America and Jimmy Kimmel Live, TBS' Conan, NBC's The Tonight Show with Jay Leno and Late Night with Jimmy Fallon, CBS' Late Show with David Letterman and CBS This Morning. Tickets available at http://www.ticketsage.com/_lubbock. United Supermarkets Arena, 1701 Indiana Ave; 7 p.m.
October 20….Deana Carter in Concert with Full Band - Drenched in sun-kissed natural beauty both inside and out, Deana Carter didn’t take a seemingly easy route to stardom, but instead chose to defy the conventional expectations of the typical Nashville artist blueprint and make her own mark. And she did, undeniably taking the industry and fans by storm with her wildly successful multi-platinum international debut Did I Shave My Legs For This? more than a decade ago. Anchored by the dreamy super hit ” Strawberry Wine” , Carter showcased her own blend of country and retro-rock sprinkled with the folksy singer/songwriter qualities that have garnered Deana Carter well-deserved respect and wild acclaim. Today, as she readies her latest bundle of uniquely crafted tunes for upcoming release on Southern Way of Life, Carter explores many subjects commonly shared over a quaint dinner, afternoon coffee or a sunny day hike with a good friend.The songs weave through the sometimes rocky terrain of adulthood, including loss of love, relationships on many different levels, trials, tribulations and simply put – life. Instinctively autobiographical, the subject matter mimics the interesting ride of Carter’s own life – so far. Tickets for Deana Carter, live at the Cactus Theater, are on sale now. Reserved seats; floor, first 5 rows $30; remaining floor $25; standard balcony $20. Purchase by visiting cactustheater.com or call 762-3233. Cactus Theater, 1812 Buddy Holly Ave; Doors open at 6:30; show at 7:30 pm..
October 21….TTU Presidential Lecture & Performance Series presents Art Spiegelman - The TTU Presidential Lecture and Performance Series welcomes Pulitzer Prize-winning artist and illustrator, Art Spiegelman. Credited for almost single-handedly bringing comic books out of the toy closet and onto the literature shelves, he won the Pulitzer Prize in 1992 for his masterful Holocaust narrative Maus— which portrayed Jews as mice and Nazis as cats. Maus II continued the remarkable story of his parents’ survival of the Nazi regime and their lives later in America. His comics are best known for their shifting graphic styles, their formal complexity, and controversial content. 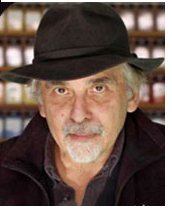 In 2005, Art Spiegelman was named one of Time Magazine’s 100 Most Influential People. Tickets are $18.00 and are available at all Select-A-Seat locations, by phone at (806)770-2000, or by visiting www.selectaseatlubbock.com. Texas Tech students may receive one free ticket at the SUB Allen Theatre Info Desk with a valid student ID. For more info visit www.presidentialseries.ttu.edu. Allen Theater, 15th St. and Akron Avenue in the Texas Tech Student Union Building; 7 p.m.
October 21….Nighthawks IV - Members of Lubbock's Ad Hoc writing group, in celebration of their fourth annual Nighthawks event, will read from current works—published as well as works-in-progress. Readings will range from poetry by Marilyn Westfall, Janice Whittington, and Melissa Brewer to prose pieces by Michelle Kraft, Sheila Delony, Barbara Brannon, and Richard Jespers. Come early to view writers' photography and other graphics that have influenced their work. Light refreshments will be served. Bring your friends and enjoy a new Lubbock literary tradition. Members of Lubbock's Ad Hoc writing group—Marilyn Westfall, Janice Whittington, Melissa Brewer, Michelle Kraft, Sheila Delony, Barbara Brannon, and Richard Jespers—are displaying their own photography, as well as graphics that have inspired them, in the Graffiti Educational Building, where their October 21 reading will take place. The title is inspired by the words of Anne Carson, who regards her words like elements of painting: "It's about the way they interact with each other as daubs of meaning . . . and you stand back and see a story emerge from the way that the things are placed next to each other. You can also do that with language." LHUCA Graffiti Educational Building, 511 Avenue. K. Event held 7 p.m. - 8:30 p.m.
October 21….The MTV Generation: ‘80s Rock Vault, Vol 1 - Rock 'n' roll entered the television mainstream in late 1981 with the launch of the all-music video channel MTV...short, of course, for "Music Television". The cable channel quickly became the hottest marketing platform in the history of popular music...and made stars out of unknown bands virtually overnight. It also helped broaden the appeal of radio stars who could then more effectively market their IMAGE - literally and figuratively - to an audience of consumers ready and waiting for this new multi-media concept. Unknowns became hot-selling stars....previously popular radio stars became video superstars...and some, like Michael Jackson, went global on a scale like no one before or since. It was truly a cultural phenomenon that heralded a whole new era for the music industry and, even more significantly, pop CULTURE, as a whole. The glory years of MTV peaked in the late '80s....evolved and changed in the '90s....and the music video format eventually gave way to virtual reality shows and faded away from its original concept. Now, the Cactus looks back at that seminal moment in history - when unknowns like Billy Idol, Pat Benatar, Joan Jett, Bryan Adams, Survivor, The Stray Cats, Prince and scores more burst into stardom through the medium of Music Television. Join The Rhythm Machine - with vocalists Bethany Longoria, Shad Daughtery, Haley Simpson and Steven Shedd - for this time-trip back to the '80s - when video didn't kill the radio star....it just made them more accessible...like never before! You'll hear the biggest hits from the video era in this special live music production. Reserved floor seats $20; standard balcony seats $15, Purchase by visiting cactustheater.com or call 762-3233. Cactus Theater, 1812 Buddy Holly Ave; Doors open at 6:45; show at 7:30 pm. October 21….Ernie Haase and Signature Sound - The Center for Global Understanding is proud to bring to Lubbock, Ernie Haase + Signature Sound who will be joined by Legendary Broadway stage artist J. Mark McVey (Jean Valjean of Les Miserables fame). Together they will perform classic songs of the American Musical Theatre including “Climb Every Mountain”, “You’ll Never Walk Alone”, “Bring Him Home”, “Sit Down You’re Rocking The Boat” and many other inspirational songs and classical Broadway theatre show tunes. For added excitement and pleasure, Ernie Haase + Signature Sound and J. Mark McVey will team up with the Lubbock Symphony Orchestra for a fantastic live performance. After performing over 50 shows this year, this will be their first performance with an on stage Symphony. You will not want to miss this magnificent, first-time combined performance which promises the audience a delightful, inspirational, and unforgettable evening. Tickets available at http://www.ticketsage.com/_lubbock/. Lubbock Memorial Civic Center Theatre, 1501 Mac Davis Lane; 7:30 p.m.
October 21 - 22….CATS Playhouse Presents "Clue" - Based on the movie based on the popular board game, this comedy begins at a dinner party hosted by Mr. Boddy, where he admits to blackmailing his visitors. These guests, who have been given aliases, are Mrs. Peacock, Miss Scarlet, Mr. Green, Professor Plum, Mrs. White and Col. Mustard. When Boddy turns up murdered, all are suspects, and together they try to figure out who is the killer. By Jonathan Lynn, directed by Mickie Klafka. Ticket prices are $16.00 for adults, $13.00 for students and seniors. Go to www.catsplayhouse.com for reservations. CATS Playhouse, 2257 34th Street; All shows at 7:30 p.m.
October 21 - 23 (Repeats Oct 28-30)…. LCT Presents: Dr. Jekyll & Mr. Hyde - A new and shocking version of Robert Louis Stevenson’s classic tale of depravity, lust, love and horror. On the fog-bound streets of Victorian-era London, Henry Jekyll’s experiments with exotic “powders and tinctures” have brought forth his other self—Edward Hyde, a sensualist and villain free to commit the sins Jekyll is too civilized to comprehend. When Hyde meets a woman who stirs his interest, Jekyll fears for her life and decides to end his experiments. But Hyde has other ideas, and so the two sides battle each other in a deadly game of cat-and-mouse to determine who shall be the master and who his slave. With multiple Hyde’s portrayed by members of the cast. From the novella “Strange Case of Dr. Jekyll and Mr. Hyde” by Robert Lewis Stevenson. Adapted by Jeffrey Hatcher. Directed by Jay C. Brown. Classic horror story: Rated: PG-13. You can purchase your tickets online at lubbockcommunitytheatre.org or by calling the office at (806) 749-2416. Lubbock Community Theatre, 4230 Boston Avenue; Friday and Saturday: 7:30 p.m. and Sunday: 2 p.m.
October 22….Funky Junk Roundup - A one day shopping extravaganza featuring a unique blend of vintage finds & inspiration, one of a kind handcrafted items, antique décor, hand painted furniture, repurposed items, rusty-chippy-shabby-reloved and refunked JUNK, bling and glam boutiques, sparkly jewels and FABULOUS JUNKTIQUES for your creative soul! For more info please go to http://www.montagefestivals.com. Lubbock Memorial Civic Center, 1501 Mac Davis Lane; 10 a.m. – 4 p.m.
October 22….Buffalo Springs Lake Harvest Festival - Join in fun at Buffalo Springs Lake. Activities Include: Food Trucks 11 a.m.- 10 p.m. Retail Vendors with unique shopping opportunities. Including crafts, clothing, home products, pumpkins, bounce house, spider climber, and rock climbing wall at no cost from 11 a.m.- 4 p.m. Games and activities including face painting and hay rides for a small fee from 11 a.m.- 4 p.m. Zombie Run – Benefitting Women’s Protective Services of Lubbock, ($20 to register) from 5 p.m.-.6 p.m. Haunted hayride – (Hayride with Zombies around every turn) from 6 p.m. – 8 p.m. Scary movie: shown on a large inflatable screen at 10:30 p.m.
October 22….Hieronymus Bosch with Christian Conrad - As we get closer to Halloween, the season of the weird, Saturdays at LHUCA will explore one of the strangest artists from history. Sixteenth-century Dutch painter Hieronymus Bosch, famous for his fantastic scenes of Armageddon and Paradise, continues to be a popular source of imagery even to this day. Each of Bosch’s painting had strange elements such as unusual creatures, but amazingly much of the paintings are rooted directly in the world around the artist. Join us as we look at the art of the uncommon and examine the imagery of the unusual in our first Halloween-themed lecture. Saturday Lectures at LHUCA is an informal conversation over the life and work of contemporary artists. It’s a stress-free opportunity to examine the art and ideas that underlie much of the modern art world. Attendees are encouraged to ask questions and join the conversation. This event is free to the public. Join us for coffee and donuts! LHUCA, 511 Ave; 11:30 a.m. – 1 p.m.
October 22….Trick or Treat Street - Trick or Treat Street is a night packed with delicious fun! Round up your fairies, superheroes and littlest goblins for this safe and friendly trick-or-treating extravaganza hosted by Safety City. Children and parents will parade around the kid-sized streets walking from one child-sized building to the next collecting treats and goodies while actively practicing good traffic safety techniques. Admission is Free. Safety City, 46th Street and Avenue U; 5 – 8 p.m.
October 22….Big XII College Football: Texas Tech vs. Oklahoma Sooners - The Red Raiders look to rebound from an agonizing loss last week as they take on the surging Sooners of Oklahoma in what will surely rank as their toughest test of the season thus far. Drive of Champions at 4th and University Avenue; 7 p.m.
October 22….GIANT Screen Football: Texas Tech Red Raiders vs Oklahoma Sooners - Join us for aFREE SCREENING of the Texas Tech Red Raiders vs. Oklahoma Sooners Big XII football game as we again offer fans the chance to see the game on our new, GIANT screen in the Cactus Theater. The concession stand and Cactus Cantina will be available for your enjoyment. For this game, there is no ticket or voucher required - we simply invite fans to see the game on the big screen with us. Seating will be general admission for this event....so sit wherever you'd like on the floor (balcony will only be opened if needed). We're excited to have this brand new screen in place and the highest-quality, digital, laser projection in town! Cactus Theater, 1812 Buddy Holly Ave; Doors open at 6 p.m.; Tech game screened at 7 p.m.
October 23….Kevin Wass Faculty Tuba Recital: “Songs & Dances" - Professor of Tuba & Euphonium Kevin Wass will collaborate with Senior Staff Accompanist Susan Wass to perform a program of songs and dances for tuba and piano. Luminaries of both older (Bach and Mozart) and newer (Christian Wolff and Leslie Bassett) eras of composition will make appearances, in addition to a special setting of Paul McCartney’s treasured Beatles classic “Blackbird.” Free to the public. Hemmle Recital Hall, Texas Tech University; 4 p.m.
October 23….Orchid Ensemble Guest Artist Recital - The Orchid Ensemble has been tirelessly developing an innovative musical genre based on the cultural exchange between Western and Asian musicians. Lan Tung (erhu), Yu-Chen Wang (zheng), and Jonathan Bernard (percussion) blend ancient musical instruments and traditions from China and beyond, creating a beautiful new sound. They have embraced a variety of musical styles to their repertoire, ranging from the traditional and contemporary music of China, world music, and new music, to jazz and creative improvisation. Free, and open to the public. Hemmle Recital Hall, Texas Tech University; 8 p.m. The Question: Which concert pianist scored a monster instrumental hit in 1955 with the song "Autumn Leaves" ??? For this contest, 1 winner will receive 2 tickets to see The MTV Generation: ‘80s Rock Vault, Vol 1 at the Cactus Theater, Friday night at 7:30 pm. To win these tickets, correctly answer the trivia question below and email it to us at info@lubbockfunclub.com using the fun phrase "Rock 'n' Roll Rewind" as your subject title. Trained at the Accademia di Brera and as an architect, Turin-based artist Ezio Gribaudo brings to his visionary art a distinctive sense of chromatic precision and historical determination that derive from his work as a painter, sculptor, and graphic artist. His award-winning production has been recognized with various international prizes, among which the IX Rome Quadriennale in 1965, the XXXIII Venice Biennale Prize (for graphic arts) in 1966, and the São Paulo Biennial in 1967. Gribaudo’s prolific production and diversified activities have given him a highly significant presence in contemporary Italian art. He worked with Francis Bacon, Giorgio de Chirico, Willem De Kooning, Marcel Duchamp, Peggy Guggenheim, Joan Miró, Henry Moore, the CoBrA Group with Pierre Alechinsky, Karel Appel, Jean-Michel Atlan, and Asger Jorn, to mention a few artists and personalities with whom he crossed paths. Through his committed activity as an art publisher, he mentored and promoted many of the most relevant figures in modern art since the 1950s. His experimentations with materials and print bring to light archeological remnants in the context of intense chromatic studies. A specific line of his work is called logogrifi (a term of Greek origins evoking fishnets and objects that are caught in a specific moment in time). They can be understood as a verbal commentary that incorporates ancient texts, maps, and artifacts within the painting’s visual space. These works are based on the engraving of white surfaces, resulting in dazzling white on white compositions that frame memories of daily objects in visual renderings reminiscent of Duchamp’s readymades. Giorgio de Chirico pointed out that Gribaudo’s work has elevated the use of white to a whole new conceptual level. Gribaudo has also perfected the use of paper as a philosophical concept whereby incisions and collages map the archeology of human and animal experience. His use of a manual press renews the function of an old and noble instrument, now incorporated with craft and ability in the artist’s daily practice. The career and artwork of Ezio Gribaudo will be celebrated on October 29 from 7:00 pm to 9:00 pm. 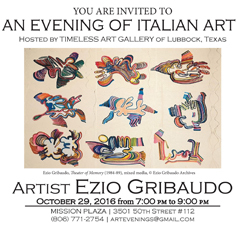 The Lubbock art community is invited to celebrate this internationally acclaimed artist. The event takes place at Timeless Art Gallery, 3501-50th St, Suite 112. Goodies Delivered to Your Door via Orders Placed Through Downloadable App - Special Offer! You can now get Sugarista Cookies and Treats delivered to your doorstep thru a downloadable app called Tapingo Thursday through Sunday evening from 7pm - Midnight! SPECIAL OFFER THIS FRIDAY and SUNDAY for the FIRST 50 CUSTOMERS! In fact, if you download the Tapingo app (http://www.tapingo.com/) this weekend and are one of the first 50 people to place an order at 10 pm on Friday or Sunday Night, you can buy SIX cookies for ONE DOLLAR! The six pack of cookies will include two chocolate chip, two red velvet and two sugar sprinkle cookies! Be sure to take advantage of this awesome introductory deal! We are also coming soon to the Revolutionary Farmer's Market at the South Plains Mall!